The tropical fish all turn and see the piranha, then scatter out of the shot. I rendered these fish in the Softimage renderer. What happened to the center of this image? 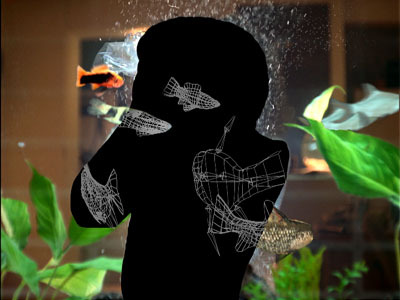 In the commercial, this shot showed an actress holding up the plastic bag with the piranha in it, and peering into the aquarium. I have heard that the Screen Actor's Guild wants web publishers to pay a fee for use of an actor's image on-line (even if the same production-still could be released freely to the printed press), so I didn't get permission to show the actress on this web site. I have replaced her area of the image with the original wireframe preview of the fish animation. At least this lets you compare final fish to wireframe fish at the edges.